Your ticket to the underwater world! 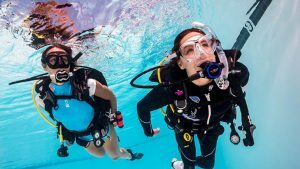 Whether you’ve done a Discover Scuba Diving program before or you are completely new to diving, The Dive Shack’s PADI Open Water Diver Course is the way to go when you want to learn how to scuba dive in a comfortable and fun way! The Open Water Diver Course will open the door to a completely new world, with different animals, plants and objects that we’re used to on land. Besides the pristine reefs and world famous wreck and jetty dives in South Australia, think about what you can see on local, interstate or international trips! Think about trips to Kangaroo Island, the famous Great Barrier Barrier reef or a trip to the tropical waters of Thailand or Fiji. By becoming a certified Open Water Diver, you open the door to these whole new worlds. The Dive Shack’s professional staff has been diving and teaching all over South Australia for many years. With this extensive experience, we can offer you the opportunity to learn the very first steps of diving, with our Try Scuba Diving and the PADI Open Water Course. We also teach specialist and professional disciplines with the internationally recognised organisation, PADI. If you have any questions, please feel free to ask! Any of The Dive Shack’s friendly dive or shop team members as they will be able to answer any question you may have regarding diving in South Australia, diving packages, courses, equipment and products and much more! The Dive Shack offers a large variety of specialty courses as a basis for continuing education ratings. You have the choice which programs you want to go for in order to reach your personal goals in diving! By continuing your diving education with The Dive Shack, you allow yourself to not be restricted when travelling to and diving in new and exotic locations. By doing your advanced course you will be able to dive to depths of 30 metres and open new horizons for your diving future. To start with these courses, you will need to make a choice of which specialties you want to do. 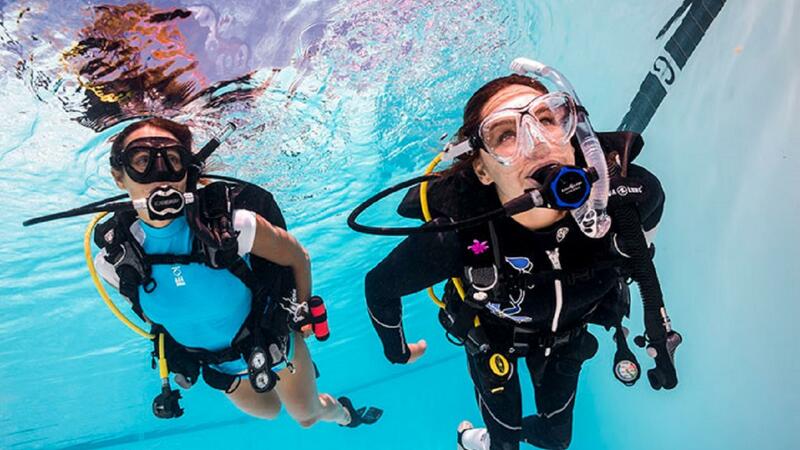 The Dive Shack offers a large variety of PADI Specialty Courses as a basis for the continuing education ratings. The choice which programs you want to go for in order to reach your personal goals in diving is entirely up to you! And don’t forget that it’s also possible to combine specialties, for example, combine the Boat Diving Specialty with the Deep Diving Specialty! Whether you want to go deep or stay down longer, want to dive a wreck or prefer to dive in the dark, the possibilities are endless! Once you’ve tried it we know you’ll love it! The PADI Discover Scuba Diving program lets you uncover new thrills in a completely new dimension under the supervision of one of The Dive Shack’s friendly dive professionals! Experience new adventures and explore undiscovered worlds right around the corner! While enjoying the freedom of gliding through South Australian waters, you’ll master some basic concepts and scuba skills! You will enjoy the many thrills diving has to offer and experience the fantastic feelings of breathing underwater and of being weightless. Be ready to enjoy a new challenge and to dive into a completely different world with The Dive Shack! The Dive Shack’s teaching system, PADI’s training and Dive Centre Standards are the perfect blend of structure and flexibility. We teach you to be a professional educator capable of making adjustments to meet the challenges of the environment as well as the needs of your students. We can teach you what it takes to work successfully in a retail environment, the ins and outs of the diving industry, everything about diving equipment and what it takes to train the most confident and comfortable divers!